My Fast Ferry's Smartcard is designed to provide regular users with cheaper fare options, reduce the number of sales transactions and speed up vessel boarding time. No need to queue for tickets or worry about having the correct change. Simply tap and go and enjoy the journey across the harbour. Smartcards purchases and Smartcard top ups can be made at sales counters or on board vessels. 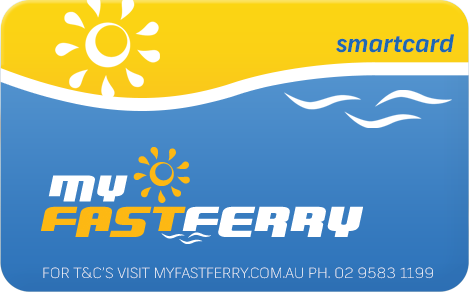 Load value onto your ‘keep and reuse’ Smartcard to pay for travel on My Fast Ferry Services. $50 minimum top up. To receive service notifications and protect your balance against loss or theft you must register your details. Customers must register their Smartcard after purchase to ensure unused funds can be transferred if the card is lost or damaged. If you wish to use your Smartcard to pay for a child or others travelling with you, please inform sales staff prior to tapping your Smartcard. System adjustments may need to be made to ensure the correct fare/s are deducted from your Smartcard. Failure to use Smartcard correctly is deemed as ‘fare evasion’which is a criminal offence. An amber light will flash on the reader when the Smartcard has been used correctly, the amount deducted and the remaining balance on your card will be displayed on the screen. A red light will flash on the reader if there are not sufficient funds available to cover the cost of your travel. If the red light flashes you must top up your card and tap again to pay before boarding. The correct fare must be paid before boarding, otherwise entry to the vessel will be refused. For travel convenience it is important the you check your balance regularly and load value onto your Smartcard before it runs out. Staff onboard the vessel will assist you if you wish to check your Smartcard balance or top up your card during your journey across the harbour.